The very first time a baby tries to walk that parent is ever so close holding their hands and picking them up after every time they fall. The parent feels that they are simply helping that child to walk but in reality they are hurting, because the child will never learn to walk until that parent let go the hand and let the child do it on their own. Sure the child struggles at first, but after many failed attempts that child learns to walk only after that parent stops helping. So from infancy even through adulthood we live our lives with "so-called" safety nets for just in case we fall. Sometimes I feel this is how we operate with our faith in God. We set up safety nets for just in case the Lord fails to come through. We limit the power of God not necessarily by our unbelief but by "partial belief." And partially believing is just as detrimental as not believing at all. We say that we walk by faith, but we really live by sight. For example, our faith says "God can and will heal" but our safety net says "if he does not heal, then I have medical insurance and I'll just run to my doctor." Our faith says "God will provide" but our safety net says "I have great credit so I can just get a loan from the bank." So in reality what we "say" we believe speaks totally different from what we really believe. God requires full faith in him. 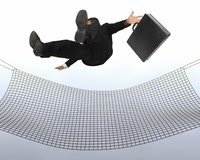 Safety nets take the glory from God and place it on man-made means and solutions. So instead of us thanking God for healing we give credit to the doctor and his prescriptions. God desires for us to have full faith in him because full faith reveals his full power and anything less is a sad replica of the real thing. I would like to highlight two examples in the bible to illustrate my point. First, the bible tells of Jesus going to his town and he was not able to do "many" mighty works due to their unbelief. Their unbelief limited the move of Jesus in his own city (how ironic). Jesus was still able to do "some work" but many more miracles could have taken place if only they had believed. Moral of the story is, we won't see Jesus operate in his fullness and his glory if we allow doubt to reside in our hearts. Secondly, the bible also speaks of the the lady with the issue of blood. For 12 years she was plagued with a disease that only grew worst as time moved on. She went to the physicians of her day but none could help. Finally Jesus was passing by and it was her last chance to be cleansed from this dreadful disease. She touches the master's garment and immediately was made whole. Many of us is just like this lady. We expend many options only to come back to the MAIN one. We set up safety nets or "just incase plans" limiting the power of God due to our unbelief. The irony however, is the safety net which is there to help us, (just like that parent who is trying to "help" that child walk by holding their hand) only makes it worst. So finally we come to Jesus and he deliver us from our issues but sadly just the lady, Jesus was our last resort. Great men and women in the bible were only great because of their faith in God; for by it (faith) they obtained a good report. The common denominator between Abraham, Moses, David, Jospeh, Joshua, and even Rahab the harlot was their faith in God. Faith pleases God, it opens doors, makes the impossible possible and move mountains. Faith should not be outcome driven but be driven by our belief in God. The outcome/answer of prayers will vary and may not be to our liking. Sometimes we will have faith for God to heal and he simply will not heal for reasons unknown. Our faith however should say "even if he doesn't heal me, I still know he is a healer." So though sometimes the results may not be to our liking, true faith does not waver according circumstances or outcomes. The ministry of Jesus led him to many people with different diseases and repeatedly it was by their faith they were made whole. Now if Jesus did not heal all those people most likely they would've died in their conditions. They couldn't fall back on the safety net of medicine for their healing, because they had none. I fear that if we don't personally cut our safety nets the Lord himself will have to, so that he can get the glory out of our lives. So have faith in God and cut the the safety nets of doubt and fear and see God's fullness and glory displayed in your life! I echo the words of Bro. Mooney "when God has a gigantic task to be performed, faith gets the contract."